Seat of an important oracle and temple of Apollo at least as early as the seventh century, Delphi received pilgrims from all over Greece. She was enriched, too, as numerous city-states sent their votive gifts and erected shrines there. 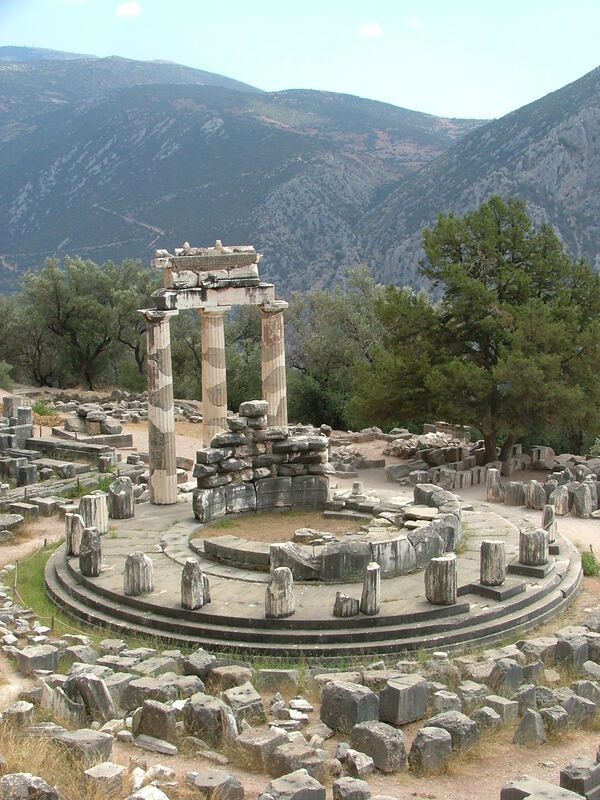 The Pythian Games, in honor of Apollo, were held at Delphi every four years. (Pfeiffer, The Wycliffe Historical Geography of Bible Lands). 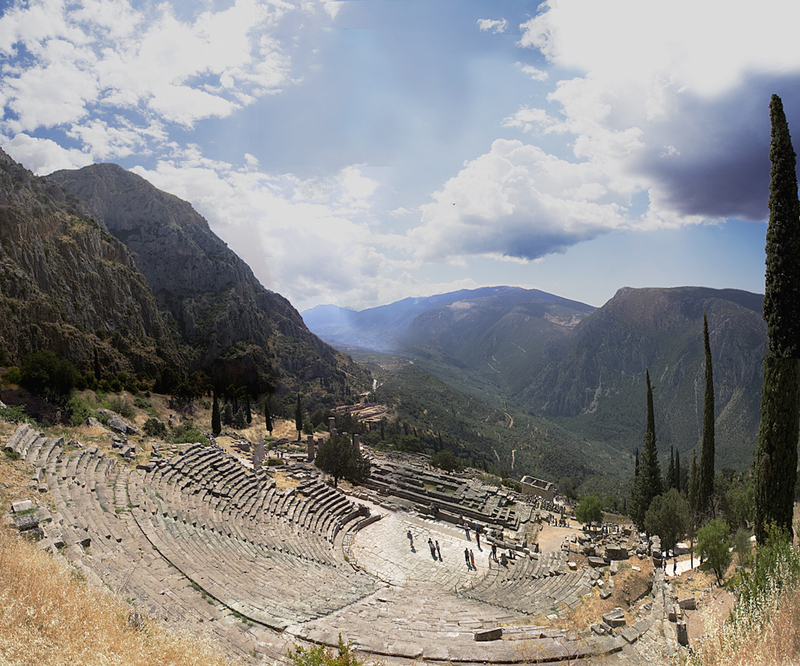 This photo shows the theater of Delphi. At bottom center is the temple of Apollo. When it is surrounded by blooming almond trees in the spring, Delphi is surely one of the most beautiful places in the world. The ancient Greeks agreed and described it as the center (literally, the navel, omphalos) of the world. The Sacred Precinct of Delphi comprises, in addition to the temple of Apollo, an impressive theater, the Bouleuterion (council chamber) of the city, numerous treasuries of Greek cities that held valuable offerings to Apollo, and many monuments and altars. From the entrance, the Sacred Way leads uphill between the bases of monuments that celebrated military victories and more than twenty treasuries that held votive offerings. The Treasury of the Athenians (510 B.C.E.) has been reerected in the form of a Doric temple. The Temple of Apollo itself was originally built in the 7th century B.C.E. ; it burned to the ground in 548 B.C.E. and was rebuilt in 531 B.C.E. This later temple collapsed from an earthquake in 373 B.C.E. Only the foundations of the third temple (346–320 B.C.E.) remain today. Here is a photo of the Sanctuary of Athena. This tholos, or rotunda, was build early 4th century BC. Sanctuary of Athens at Delphi. Photo by By KufoletoAntonio De Lorenzo and Marina Ventayol. Wikipedia. One very important artifact in the Delphi Museum is the Gallio inscription. 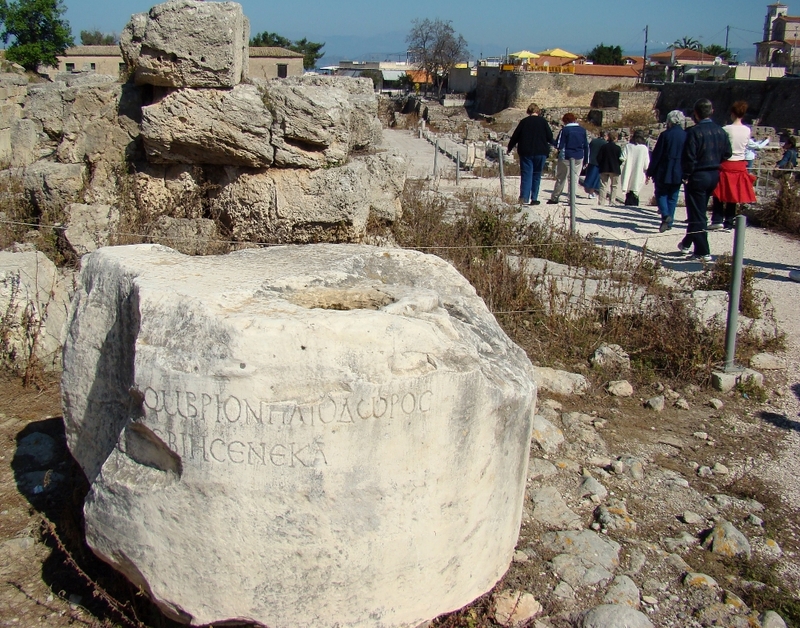 Gallio is the Proconsul of Achaia before whom Paul stood for trial at Corinth as related in Acts 18:12ff. For a photo of this inscription click here. 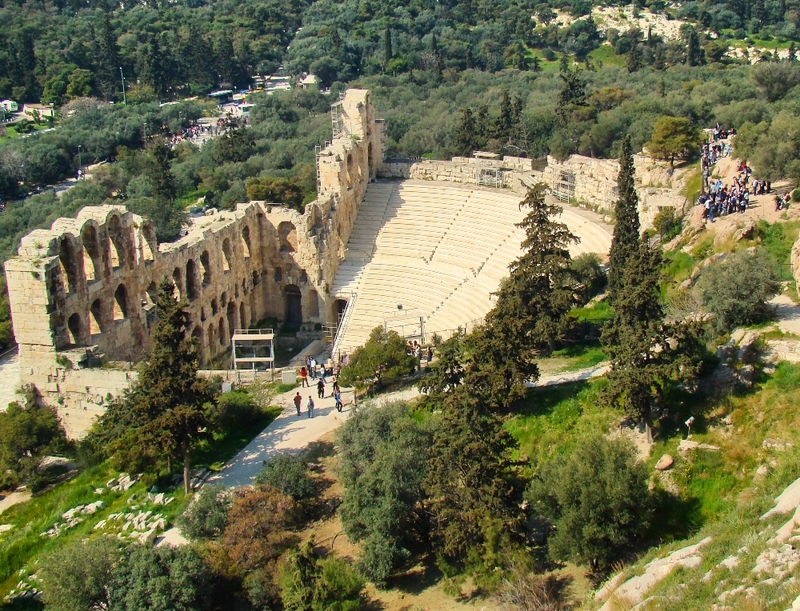 On the south slope of the Athenian Acropolis you can view the Odeon of Herodes Atticus. An odeon was a theater built for musical performances and poetry competitions. This structure post-dates the apostle Paul and his preaching here (Acts 17) by about a century. Odeon of Herodes Atticus. Athens, Greece. Photo by Leon Mauldin. whose life reads like something out of the Arabian Nights; he inherited his extraordinary wealth from his father, who found a treasure outside Rome. Famous in its time for having no interior columns to support its long-gone cedar wood roof, the 6,000 seat Odeion hosts the excellent Festival of Athens, where modern European and ancient Greek cultures meet in theatre, ballet and classical concerts performed by companies from all over the world. (Greece by Dana Facaros & Linda Theodorou. Cadagan Guides. p.119). Click image for larger view. For other posts on Athens, Greece use search box at upper right. 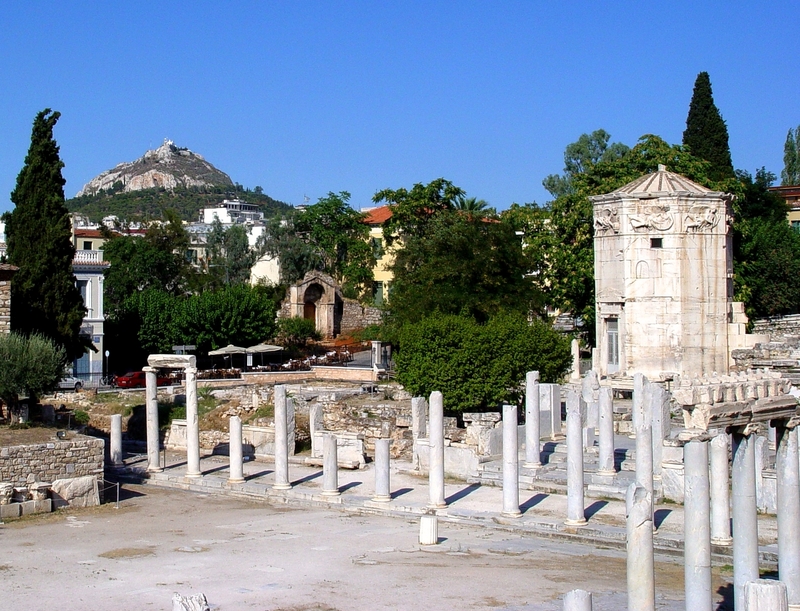 In Acts 17 Luke narrates how Paul was invited to speak to the men of Athens in the midst of the Areopagus, at Mars Hill. Among the listeners were Epicurean and Stoic philosophers (v.17). He began his address by referencing an altar in their city with this inscription: “TO THE UNKNOWN GOD.” Using that as his starting point, he contrasted the true God with the idols they worshiped. The true God made all things, including us. He gives unto us life, breath, and all things. Because He is the Creator, and we are His creatures, we must seek after Him and find Him. He commands all men everywhere to repent; a day is coming in which He will judge the world in righteousness by the One whom He raised from the dead (summary of vv. 23-31). Today at the site of Mars Hill there is a bronze plaque with the text of Paul’s sermon engraved in the Greek language. 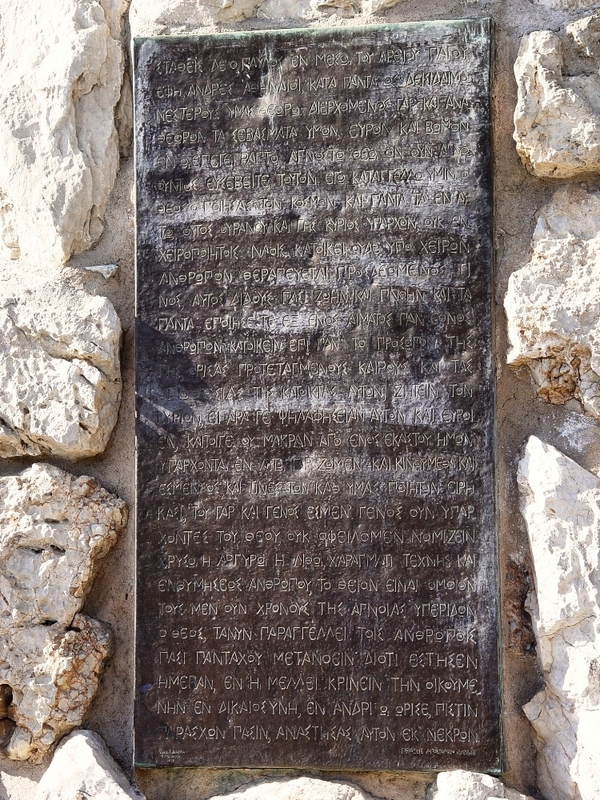 Paul’s Acts 17 sermon, on bronze plaque at base of Mars Hill, Athens, Greece. Photo by Leon Mauldin. The Greeks did not believe in a resurrection, so as soon as Paul mentioned that, many of his audience stopped listening (v.32). Others procrastinated (v.32). But there were some converts to Christ there: Dionysius the Areopagite, a woman named Damaris, and others with them” (v.34). We have numerous other posts on Athens. Use search box at above right. You are currently browsing the Leon's Message Board blog archives for February, 2015.